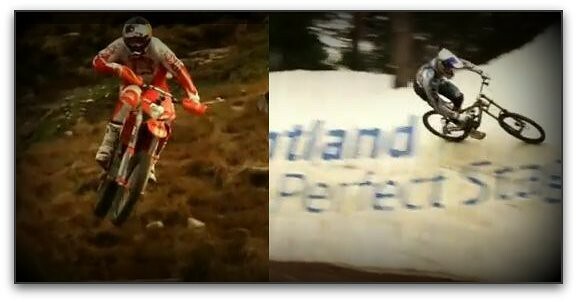 Something that I've often thought is how would a dirt biker stack up against a downhill mountain biker on a downhill type course..guess someone else thought of it too! But, how would you ever determine what terrain combination would be fair to compare the two? Obviously each machine has different strengths and weaknesses and depending on how many tight turns, the steepness of the grade, consistency of the soil etc. one machine would tend to be faster on a course that would favor it's strengths over the other. In this video, David Knight takes on Gee Atherton on a Downhill MTB course, the MTB's home turf! Knight has a slight lead halfway through. It's amazing how Knight can throw the bike around. Think is a fair competition? Either way, it's fun to watch!! Looks like they had a lot of fun. It's pretty impressive that those two guys can do all that on their bikes without falling off or the tyres slipping. Dude, that's a way cool competition. I think the mountain biker knows the course more, if the motor biker went down it again, he would beat him, lol. Any, it was fun to watch! Ok, now take them both to a enduro track and see if the biker can stay within 5 sec. True, I think he can feel pretty dang good about being within 5 seconds on that trail..he hauled!! He made that 250 pound bike look light.